Nâzım Hikmet Ran (15 January 1902 – 3 June 1963), commonly known as Nâzım Hikmet (Turkish pronunciation: [ˈnaːzɯm ˈhikmet] (listen)) was a Turkish poet, playwright, novelist, screenwriter, director and memoirist. He was acclaimed for the "lyrical flow of his statements". Described as a "romantic communist" and "romantic revolutionary", he was repeatedly arrested for his political beliefs and spent much of his adult life in prison or in exile. His poetry has been translated into more than fifty languages. According to Nâzım Hikmet, he was of paternal Turkish and maternal German, Polish, Georgian descent. Nâzım Hikmet's mother came from a distinguished, cosmopolitan family with predominantly Circassian (Adyghe) roots, along with high social position and relations to Polish nobility. From his father's side he had Turkish heritage. His father, Hikmet Bey, was the son of Çerkes Nâzım Pasha, after whom Nâzım Hikmet was named. Nazım’s maternal grandfather, Hasan Enver Pasha, was the son of Polish-born Mustafa Celalettin Pasha and Saffet Hanım, daughter of Serbian Omar Pasha and Circassian Adviye Hanım the daughter of Çerkes Hafız Pasha. Mustafa Celalettin Pasha (born Konstanty Borzęcki herbu Półkozic) authored "Les Turcs anciens et modernes" ("The Ancient and Modern Turks") in Istanbul, in 1869. This is considered one of the first works of national Turkist political thought. Nâzım Hikmet's maternal grandmother, Leyla Hanım, was the daughter of Mehmet Ali Pasha, of French (Huguenot) and German origin, and Ayşe Sıdıka Hanım who was a daughter of Çerkes Hafız Paşa. His uncle, Enver Celalettin Pasha, was a member of the Ottoman Army General Staff. 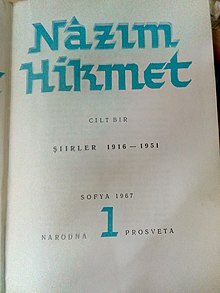 Nâzım Hikmet and Celile Hanım's cousins included Oktay Rifat Horozcu, a leading Turkish poet, and the statesman Ali Fuat Cebesoy, among others. Ran was born on 15 January 1902, in Selânik (Salonica), where his father was serving as an Ottoman government official. He attended the Taşmektep Primary School in the Göztepe district of Istanbul and later enrolled in the junior high school section of the prestigious Galatasaray High School in the Beyoğlu district, where he began to learn French; however, in 1913, he was transferred to the Numune Mektebi in the Nişantaşı district. 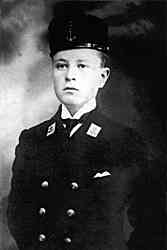 In 1918, he graduated from the Ottoman Naval School on Heybeliada, one of the Princes' Islands located in the Sea of Marmara. His school days coincided with a period of political upheaval, during which the Ottoman government entered the First World War, allying itself with Germany. For a brief period he was assigned as a naval officer to the Ottoman cruiser Hamidiye; however in 1919 he became seriously ill and, not being able to fully recover, was exempted from naval service in 1920. In 1921, together with his friends Vâlâ Nûreddin (Vâ-Nû), Yusuf Ziya Ortaç and Faruk Nafiz Çamlıbel, he went to İnebolu in Anatolia in order to join the Turkish War of Independence; from there he (together with Vâlâ Nûreddin) walked to Ankara, where the Turkish liberation movement was headquartered. In Ankara they were introduced to Mustafa Kemal Pasha (Atatürk) who wanted the two friends to write a poem that would invite and inspire Turkish volunteers in Istanbul and elsewhere to join their struggle. This poem was much appreciated, and Muhittin Bey (Birgen) decided to appoint them as teachers to the Sultani (high-college) in Bolu, rather than sending them to the front as soldiers. However, their communist views were not appreciated by the conservative officials in Bolu, and so the two decided to go to Batumi in the Georgian Soviet Socialist Republic to witness the results of the Russian Revolution of 1917, arriving there on 30 September 1921. In July 1922, the two friends went to Moscow, where Ran studied Economics and Sociology at the Communist University of the Toilers of the East in the early 1920s. There, he was influenced by the artistic experiments of Vladimir Mayakovsky and Vsevolod Meyerhold, as well as the ideological vision of Lenin. Despite writing his first poems in syllabic meter, Nazım Hikmet distinguished himself from the "syllabic poets" in concept. With the development of his poetic conception, the narrow forms of syllabic verse became too limiting for his style and he set out to seek new forms for his poems. He was influenced by the young Soviet poets who advocated Futurism. On his return to Turkey, he became the charismatic leader of the Turkish avant-garde, producing streams of innovative poems, plays and film scripts. Breaking the boundaries of syllabic meter, he changed his form and began writing in free verse, which harmonised with the rich vocal properties of the Turkish language. He has been compared by Turkish and non-Turkish men of letters to such figures as Federico García Lorca, Louis Aragon, Vladimir Mayakovsky, Faiz Ahmed Faiz and Pablo Neruda. Although Ran's work bears a resemblance to these poets and owes them occasional debts of form and stylistic device, his literary personality is unique in terms of the synthesis he made of iconoclasm and lyricism, of ideology and poetic diction. Many of his poems have been set to music by the Turkish composer Zülfü Livaneli. A part of his work has been translated into Greek by Yiannis Ritsos, and some of these translations have been arranged by the Greek composers Manos Loizos and Thanos Mikroutsikos. Because of his political views his works were banned in Turkey from 1938 to 1965. Ran's imprisonment in the 1940s became a cause célèbre among intellectuals worldwide; a 1949 committee that included Pablo Picasso, Paul Robeson, and Jean-Paul Sartre campaigned for his release. On 8 April 1950, Ran began a hunger strike in protest against the Turkish parliament's failure to include an amnesty law in its agenda before it closed for the upcoming general election. He was then transferred from the prison in Bursa, first to the infirmary of Sultanahmet Jail in Istanbul, and later to Paşakapısı Prison. Seriously ill, Ran suspended his strike on 23 April, the National Sovereignty and Children's Day. His doctor's request to treat him in hospital for three months was refused by officials. So, as his imprisonment status had not changed, he resumed his hunger strike on the morning of 2 May. Ran's hunger strike caused a stir throughout the country. Petitions were signed and a magazine named after him was published. His mother, Celile, began a hunger strike on 9 May, followed by renowned Turkish poets Orhan Veli, Melih Cevdet and Oktay Rıfat the next day. In light of the new political situation after the 1950 Turkish general election, held on 14 May, the strike was ended five days later, on 19 May, Turkey's Commemoration of Atatürk, Youth and Sports Day, he was finally released through a general amnesty law enacted by the new government. 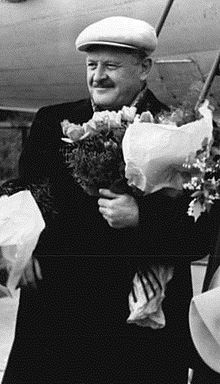 On 22 November 1950, the World Council of Peace announced that Nazım Hikmet Ran was among the recipients of the International Peace Prize, along with Pablo Picasso, Paul Robeson, Wanda Jakubowska and Pablo Neruda. Later on, Ran escaped from Turkey to Romania on a ship via the Black Sea, and from there moved to the USSR. Because in the Soviet bloc the only recognized Turkish minority existed in communist Bulgaria, the poet's books were immediately brought out in this country, both in Turkish originals and Bulgarian translations. The communist authorities in Bulgaria celebrated him in Turkish and Bulgarian publications as 'a poet of liberty and peace.' The goal was to discredit Turkey presented as a 'lackey of the imperialist' United States in the eyes of Bulgaria's Turkish minority, many of whom desired to leave for or were expelled to Turkey in 1950-1953. When the EOKA struggle broke out in Cyprus, Ran believed that the population of Cyprus would be able to live together peacefully, and called on the Turkish minority to support the Greek Cypriots' demand for an end to British rule. Persecuted for decades by the Republic of Turkey during the Cold War for his communist views, Ran died of a heart attack in Moscow on 3 June 1963 at 6.30 am while picking up a morning newspaper at the door of his summer house in Peredelkino, far away from his beloved homeland. He is buried in Moscow's famous Novodevichy Cemetery, where his imposing tombstone is still today a place of pilgrimage for Turks and many others from around the world. His final wish, never carried out, was to be buried under a plane-tree (platanus) in any village cemetery in Anatolia. Despite his persecution by the Turkish state, Nâzım Hikmet has always been revered by the Turkish nation. His poems depicting the people of the countryside, villages, towns and cities of his homeland (Memleketimden İnsan Manzaraları, i.e. Human Landscapes from my Country), as well as the Turkish War of Independence (Kurtuluş Savaşı Destanı, i.e. The Epic of the War of Independence), and the Turkish revolutionaries (Kuvâyi Milliye, i.e. Force of the Nation) are considered among the greatest patriotic literary works of Turkey. Following his death, the Kremlin ordered the publication of the poet's first-ever Turkish-language collected works in communist Bulgaria, where at that time a large and still recognized Turkish national minority existed. 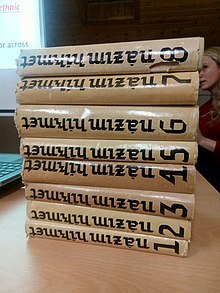 The eight volumes of these collected works, Bütün eserleri, appeared at Sofia between 1967 and 1972, that is, in the very last years of the existence of the Turkish minority educational and publishing system in Bulgaria. Ran had Polish and Turkish citizenship. The latter was revoked in 1959, and restored in 2009. His family has been asked if they want his remains repatriated from Russia. During the 1940s, as he was serving his sentence at Bursa Prison, he used to paint. There, he met a young inmate named İbrahim Balaban. Ran discovered Balaban's talent in drawing, gave all his paint and brushes to him, and encouraged him to continue with painting. Ran influenced the peasant, and educated him, who had finished only a three-grade village school, in forming his own ideas in the fields of philosophy, sociology, economics and politics. Ran admired Balaban much, and referred to him in a letter to the novelist Kemal Tahir as "his peasant painter" (Turkish: Köylü ressam). Their contact remained also after they were released from the prison. Ran's poem Kız Çocuğu (The Girl Child) conveys a plea for peace from a seven-year-old girl, ten years after she has perished in the atomic bomb attack at Hiroshima. It has achieved popularity as an anti-war message and has been performed as a song by a number of singers and musicians both in Turkey and worldwide; it is also known in English by various other titles, including I come and Stand at Every Door, I Unseen and Hiroshima Girl. Zülfü Livaneli has performed a version of the original Turkish poem on his album Nazım Türküsü, which was later sung in Turkish by Joan Baez. Fazıl Say included the poem in his Nazım oratorio in Turkish. Subhash Mukhopadhyay (poet) translated Hikmet's poems into Bengali.Those poems are collected in two anthologies, titled Nirbachita Nazim Hikmet (1952)(Selected Poems of Nazem Hikmet) ISBN 81-7079-501-X and Nazem Hikmet er Aro Kobita(1974) (More Poems of Nazem Himet).Some of these translation's are available in open sources. Manos Loizos composed settings of some of Ran's poems, adapted in Greek by the poet Yiannis Ritsos. They are included in the 1983 disc Grammata stin agapimeni (Letters to the beloved one). The usual tune is a non-traditional melody composed by Jim Waters in 1954 to fit the lyrics of Child 113 ballad The Great Silkie of Sule Skerry, which was recorded by American folksinger Joan Baez as Silkie on her second album Joan Baez, Vol. 2 in 1961. According to American activist folk musician Pete Seeger, Jeanette Turner did a loose English "singable translation" of the poem under a different title, I Come And Stand At Every Door, and sent a note to Seeger asking "Do you think you could make a tune for it?" in the late 1950s. After a week of trial and failure, this English translation was used by Seeger in 1962 with an adaptation of "an extraordinary melody put together by a Massachusetts Institute of Technology student James Waters, who had put a new tune to a mystical ballad The Great Silkie which he couldn't get out of his head, without permission." Seeger wrote in Where Have All the Flowers Gone: "It was wrong of me. I should have gotten his permission. But it worked. The Byrds made a good recording of it, electric guitars and all." Seeger also used the track in his 1999 compilation album Headlines & Footnotes: A Collection Of Topical Songs. Seeger sang the song on 9 August 2013, the 68th anniversary of the Nagasaki atomic bombing, on a Democracy Now! interview. The Byrds; the American rock band used the translation on their third album Fifth Dimension in 1966. Roger McGuinn of the Byrds later recorded the song with its original lyrics as part of his Folk Den project. The Misunderstood used the translation, changing the title to 'I Unseen', on a 1969 UK Fontana single, later included in the 1997 anthology album Before The Dream Faded with their own tune. Paul Robeson recorded the song as "The Little Dead Girl" with another translation. The Fall on their 1997 album Levitate, albeit omitting the last verse and wrongly attributing writing credits to anon/J Nagle. I Come and Stand at Your Door listed as "Anon/Nagle", which is an interpretation of the song I Come and Stand at Every Door. "Jap Kid" is an instrumental version of this track. Silent Stream Of Godless Elegy, a Moravian folk metal band, on their album Behind the Shadows in 1998. Anne Hills on 1998 album Where Have All The Flowers Gone: The Songs of Peter Seeger. Styrofoam aka Arne Van Petegem's EP and first US release, RR20, included an instrumental version of the traditional tune of Great Silkie with same title. In 2005, famous Amami Ōshima singer Chitose Hajime collaborated with Ryuichi Sakamoto by translating Kız Çocuğu into Japanese, retitling it Shinda Onna no Ko [死んだ女の子] "A dead girl"). It was performed live at the Atomic Bomb Dome in Hiroshima on the eve of the 60th Anniversary (5 August 2005) of Atomic bombings of Hiroshima and Nagasaki. The song later appeared as a bonus track on Chitose's album Hanadairo in 2006. Some of Ran's poems are translated into Nepali by Suman Pokhrel and are published in print and online literary journals. How do you propose to get it? Do you want to get it through the cooperation of Turkey where the men in the ranks get 23 cents a month the first year and 32 cents the second year, or do you want to get an American division and equip it and send it over to Turkey which would cost you 10 times as much? He also opposed the Korean War, in which Turkey participated. After the Senate address of John Foster Dulles, who served as U.S. Secretary of State under President Dwight D. Eisenhower, where he valued Turkish soldiers at 23 cents a month compared with the lowest echelon U.S. soldiers at $70, Nazım Hikmet Ran wrote a protest poem criticising the policies of the United States. This poem is titled "23 Sentlik Askere Dair" (On the soldier worth 23 cents). Hikmet's poem We'll Give the Globe to the Children was set on music in 1979 by Russian composer David Tukhmanov. Tale of Tales is a Russian animated film (1979) partially inspired by Hikmet's poem of the same name. Finnish band Ultra Bra recorded a song "Lähettäkää minulle kirjoja" ("Send me books") based on a translated excerpt of Hikmet’s poem "Rubai". The Ignorant Fairies is a 2001 Italian film, in which a book by Hikmet plays a central plot role. Mavi Gözlü Dev (Blue Eyed Giant) is a 2007 Turkish biographical film about Nazım Hikmet. The title is a reference to the poem Minnacık Kadın ve Hanımelleri. The film chronicles Nazim Hikmet's imprisonment at Bursa Prison and his relationships with his wife Piraye and his translator and lover Münevver Andaç. He is played by Yetkin Dikinciler. Hikmet's poem was quoted in the 2012 Korean drama Cheongdam-dong Alice. What's the good word on Nâzım Hikmet?